Happy Fri-YAY!! As tired as I am, I can honestly say that I have had an amazing first two weeks of school! I have an amazing group of 23 students who are so kind, helpful, and ENGAGED! Can I get an amen?! I am so thankful to have such a well behaved group... it makes it that much easier to do fun and interactive activities! Because let's face it, no kid wants to complete worksheets all day (and I don't want to grade them!) especially in math! 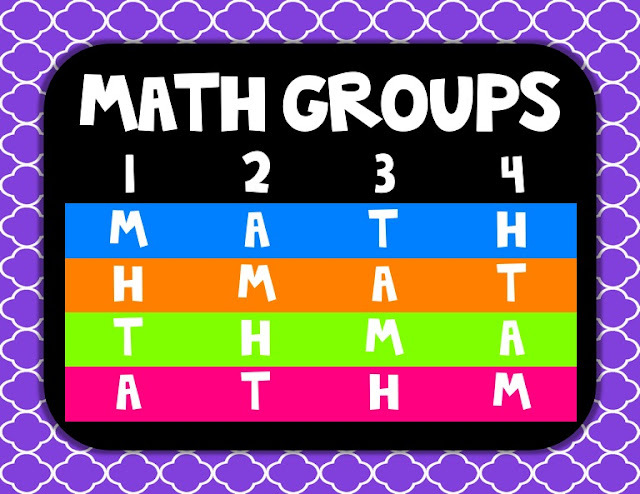 Last year I tried math groups for the first time and it was a complete and utter WRECK! 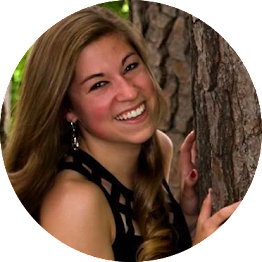 My students were constantly arguing with their peers, goofing off, and just not engaged in any way, shape, or form! I took a step back this year and realized my mess that I called math groups last year were disorganized and unstructured! No wonder my kids couldn't get the hang of it! 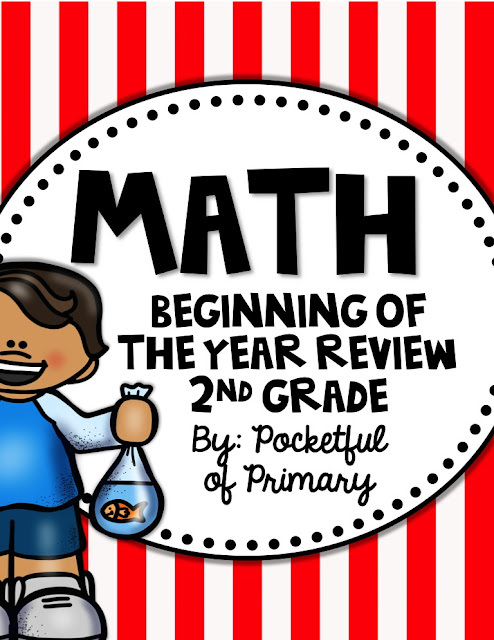 I decided this year to rejuvenate my math groups and try something completely different! I now use the acronym MATH for my math groups and it has saved my sanity! Each letter allows my students to practice important math skills while still interactive with peers in a controlled manner. I have 75 minutes of math daily. I use about 5 minutes for a math meeting and 30 minutes for whole group instruction. Math groups lasts about 40 minutes daily. This means each "center" lasts about 10 minutes. Here's what I display with my projector during math groups to guide students to the correct center. 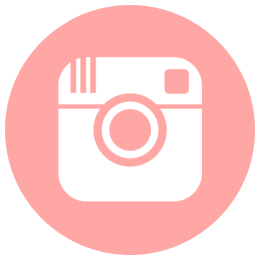 Each student is assigned to a color group: blue, orange, green, or pink. Students will change color groups depending on their ability level for each skill. The four "rotations," each lasting about 10 minutes, are shown at the top of the table. Students are able to quickly find their color and figure out which center they should visit during that rotation: M (math facts), A (at your seat), T (teacher time), or H (hands on). Here is a brief overview of each of the centers. 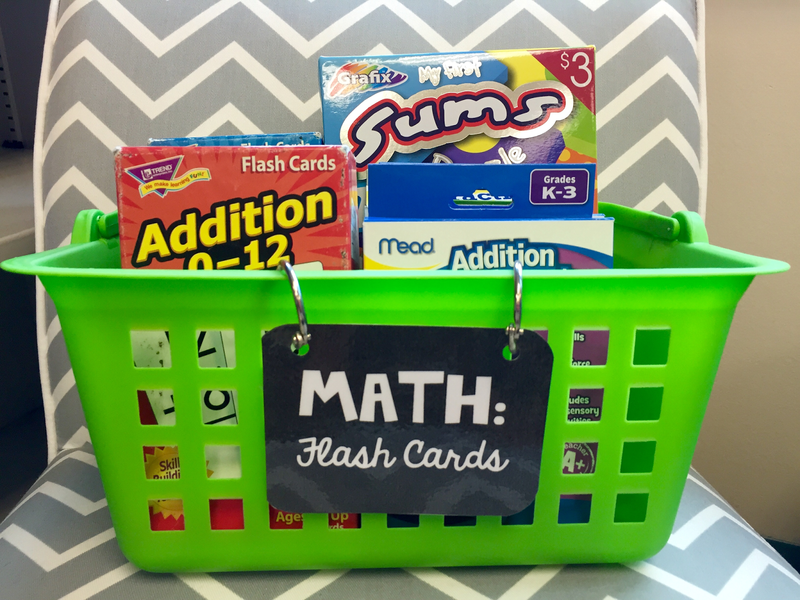 I have this basket full of different math flashcards, mostly addition and subtraction. I do have some money and time flashcards that my students may use during those units. Students visiting the M (math facts) center will either work independently or with a partner with these flash cards. All students visiting the M center must stay in the library area of my classroom! I like them to all be in one area and obviously the library is the most comfy place to practice math facts! During this time, students work independently at their desks on some kind of worksheet or project. 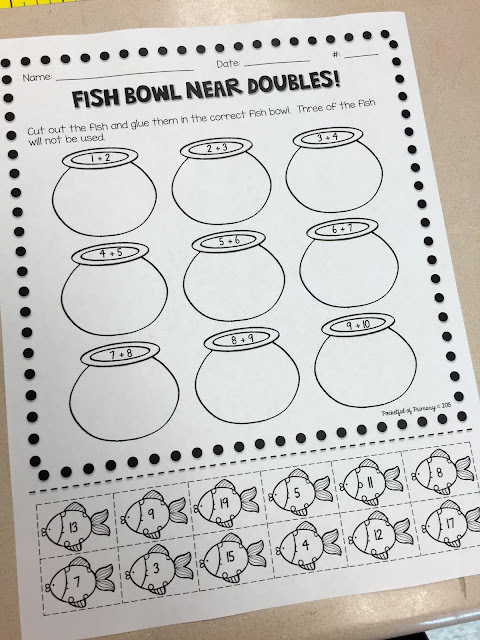 If students are completing a worksheet, I try to make it a cut and paste activity so students are more involved and aren't just filling in the blanks! Students will meet me on my front carpet with a dry erase board and marker. Typically during my math group time, I have a paraprofessional in my classroom meeting with a small group at my back table. Otherwise I would have my students meet there for teacher time (although they do love sitting on the carpet and I love being able to sit right on their level!) During this time we practice problems or skills that those particular students need extra help on. With my above level group, I use this time for enrichment and challenge them with 3rd, 4th, and even 5th grade skills! For the hands on activity, students meet in the back corner of my classroom where there is some open floor space. Students each grab a carpet square (which I store back in the corner for easy access) and get to work! THIS IS MY STUDENT'S FAVORITE CENTER! I always make the activity very hands on (duh!) and engaging for my students that need to physically manipulate something to learn best! 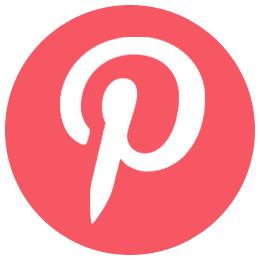 Here is an example of at your seat and hands on activities that I am using next week! I like to keep a centralized theme for these activities for the entire week. The theme will either be related to something we are reading, an upcoming holiday, or something along those lines. For next week, I chose a carnival theme. What says the end of summer better than a carnival?! I picked up a bunch of items from the dollar store that I thought I could easily turn into activities and went to work creating! I made sure that the "at your seat" activity mirrored the hands on activity so students were better able to make connections between the two. 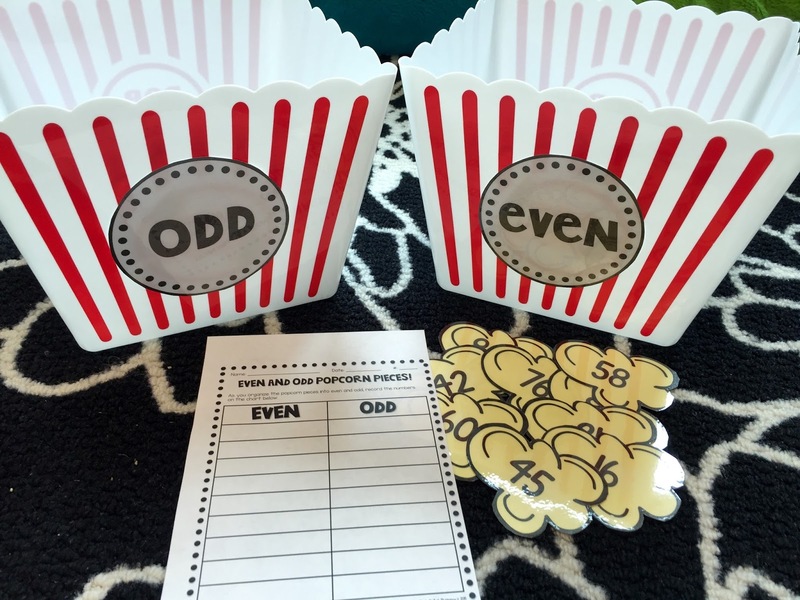 Hands on: For the hands on activity, I was inspired by one of my favorite things... FOOD! 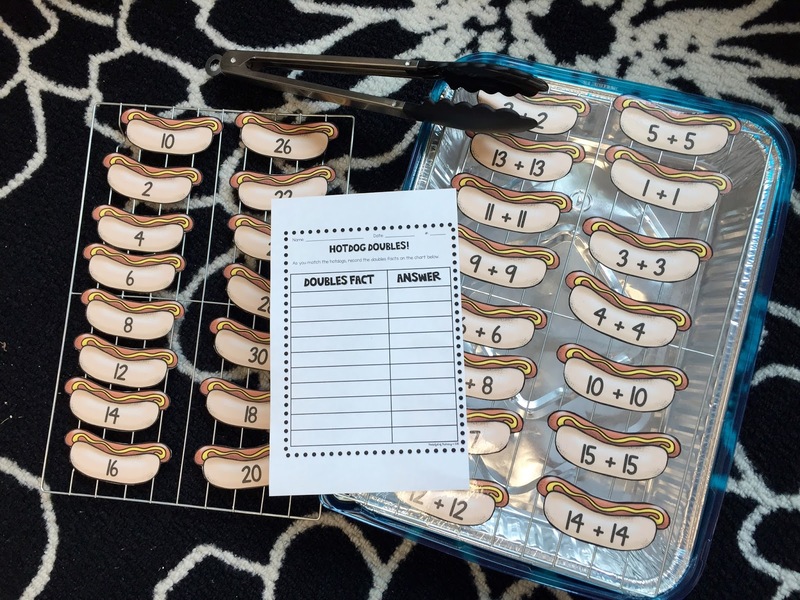 Students have to match the doubles fact to the correct answer using the tongs to pick up and move the hotdogs. 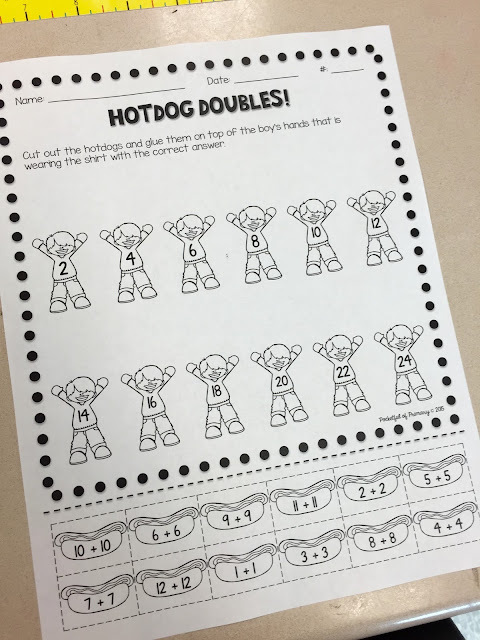 As students match the hotdogs, they will record the doubles fact and answer on their recording sheet. To create a "grill," I bought an aluminum baking dish and a pack of 2 cooling racks from the dollar store. I put one of the cooling racks in the aluminum baking dish and the other I left on the side. The tongs also came from the dollar store! Easy peasy! At your seat: This cut and paste activity mirrors the hotdog doubles. Students have to cut out the hotdogs and glue them on top of the boy's hands that is wearing the shirt with the correct answer. Hands on: What's better than winning a fish at the carnival?! 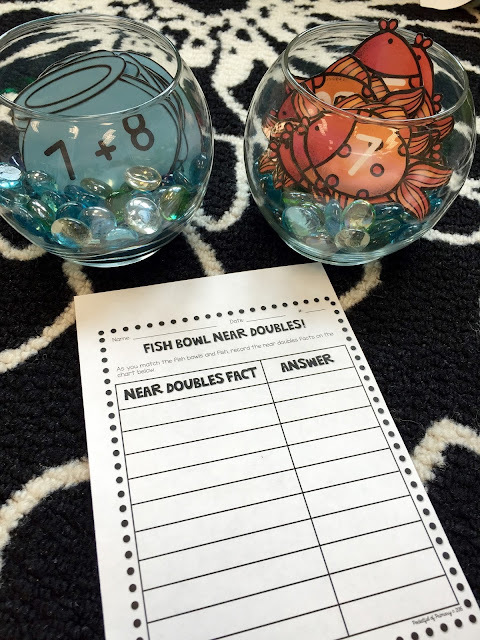 For this activity, students will match the fish bowls (with near doubles facts on them) to the fish with the correct answer. As students match them, they will record the near doubles facts and answers on the recording sheet. I used glass fish bowls and colorful stones from the dollar store to hold the cards. At your seat: Students will cut out the fish and glue them in the fish bowl with the correct near doubles fact. Three of the fish will not be used so they have to be careful! Hands on: Students will determine if the numbers on the popcorn pieces are even or odd and put them in the correct popcorn container. I have a set of 2 digit numbers and 3 digit numbers to differentiate for my different groups. 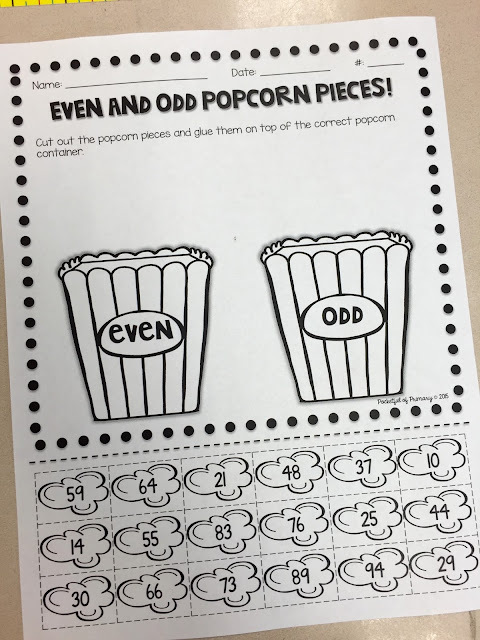 As students place the popcorn pieces in the correct popcorn container, they must write the number on their recording sheet. These popcorn containers were found at the dollar store as well! I taped on the even and odd labels. At your seat: Students will cut out the popcorn pieces and glue them on top of the correct popcorn container! I have two different versions of this worksheet - one with 2 digit numbers and one with 3 digit numbers depending on the student's ability. Hands on: Students will search through the bowl of tickets to find the large golden tickets, each with a number on it. Students will then match the tickets that make a ten. Students will record the number sentence for each way to make a ten and use two different colors to represent the number sentence on the ten frame. 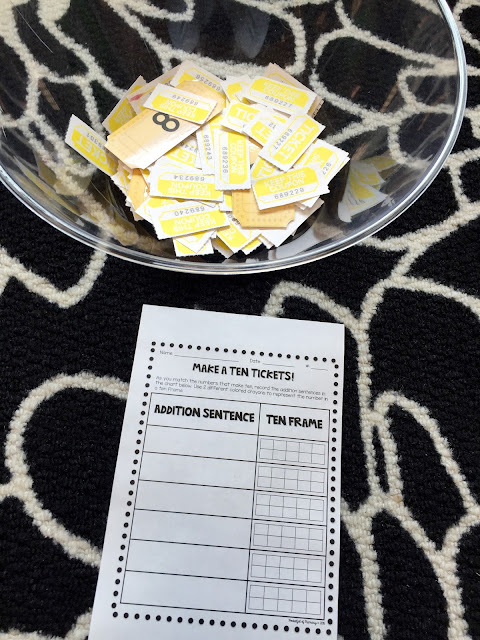 I bought a set of raffle tickets at the dollar store and added them to the bowl to make it harder for students to search. 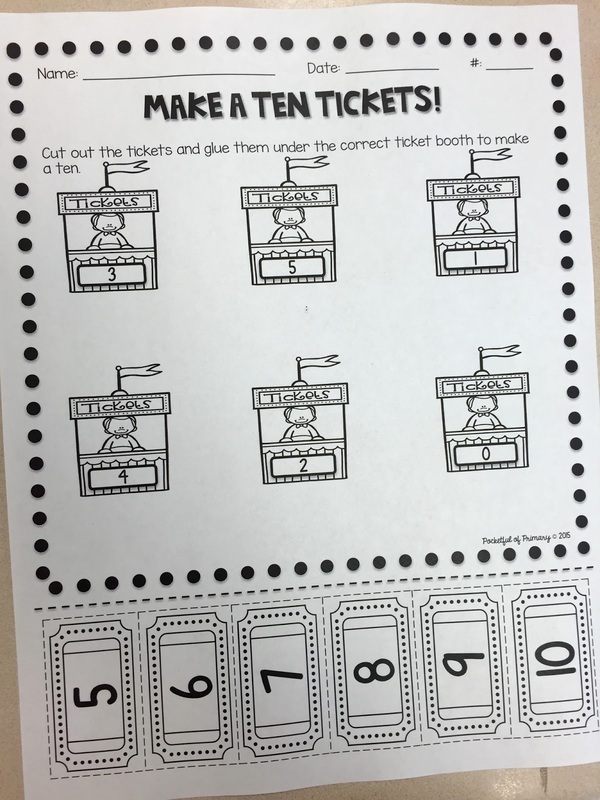 At your seat: Students will cut out the tickets and glue them under the correct ticket booth to make a ten. 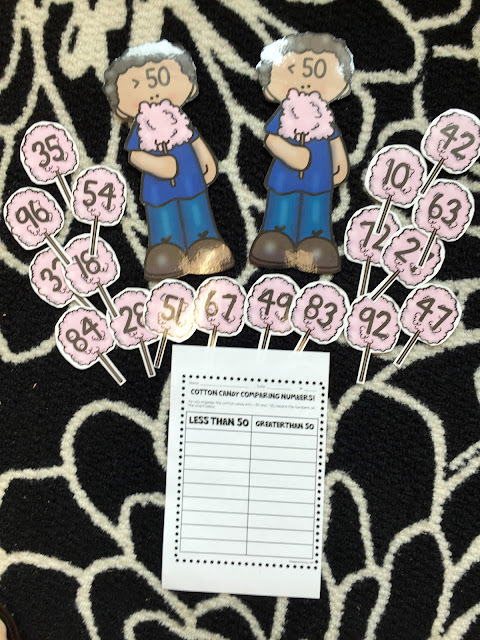 Hands on: Students will look at each 2 digit number, decide if it is greater than or less than 50, and place the cotton candy on top of the correct boy. I have a set of 3 digit numbers (and boys with greater than and less than 500) for differentiation as well. 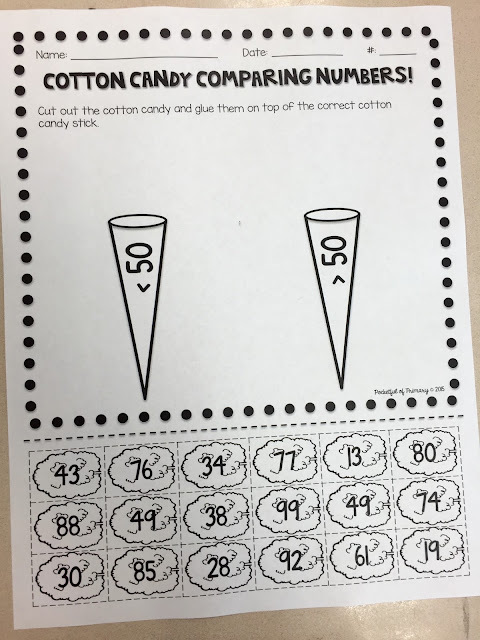 As students move the cotton candy pieces, they will record the numbers on the recording sheet. The cotton candy numbers will be stored in a small cotton candy tub that I got at the dollar store as well. At your seat: Students will cut out the cotton candy pieces and glue them on top of the correct stick. So that is what a week of math groups looks like in my classroom! It takes a lot of preparation but in the end it's worth it seeing the kiddos entirely engaged in their work! I hope you have a great weekend! Happy teaching!